I am often asked by designers for specific examples where design approaches have been used in the creation of policy. From a design perspective, the ‘concreteness’ of physical artefacts is much easier to describe, whereas both service design and policy design retain enigmatic qualities. We have often said that Policy Lab is easier to experience than explain. There is something about policy that is hard to pin down, both because it is very context specific and because it is largely intangible. This is not only the case with policy, but also echoed in the debates around ‘what is service design?’ that have accompanied this week’s service design fringe festival. The Policy Lab uses innovative approaches including design, digital and data science techniques to develop policy. As a result we have an array of examples from digital policing to mediation and divorce. Yet when asked about these examples they often raise further questions, for example about the difference between service design and policy design. Paul Maltby’s excellent series of blogs unpacking policy for digital professionals are a must read if you are interested in the intersection of design, digital and policy. Paul notes ‘policy is a word used to describe the government’s approach to a particular issue’. The Policy Lab provides real examples, through our practical projects, to demonstrate what this means in practice. Having delivered many projects now across different departments, it is not surprising that we have started to notice patterns. As a result we have begun mapping some broader frameworks which we are testing further. In this blog I wanted to share two of the frameworks we are currently using that relate to policy practice and design practice. 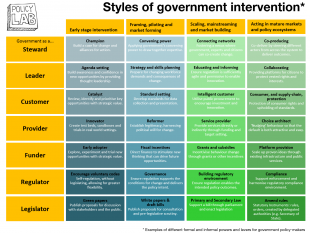 Over the summer in the Policy Lab we have started mapping different policy options, showing the variety of ways policy-makers might use their power to influence people’s actions and behaviours. We have grouped these into seven categories from low level to large scale interventions. 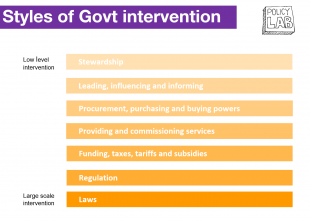 These styles of intervention include traditional law-making powers (sticks) or applying softer influencing powers (carrots) such as system stewardship. In reality policy-making is much more complex than most people imagine. From this starting point we’ve created a grid of 28 different ways policy-makers operate at different stages of maturity. This is still work in progress so we would very much welcome your thoughts. We are currently building examples for each of the styles from across government. The design choices for policy-makers early in policy development shape how a policy is delivered and the kind of results that can be achieved. We have played around a lot with the language, and will continue to test this in the Lab. However, it should be clear from the array of possibilities that determining which course of action, which levers will deliver the outcomes needed, in any particular circumstance requires great skill and judgement. The other discussions this week have been about defining service design, in particular in the (Her)Story event at the RSA where ‘service design pioneers’ met (some for the first time) to discuss the last 30 years of service design practice. At that event I shared our other framework, one that maps that relationship between traditional design, service design and policy design. Back in 2014, I wrote in the RSA journal about the etymological similarities between policy, reform and design. Both design and policy in my experience are acts of synthesis, of bringing things together through iteration, sense-making and (increasingly in policy) involve experimentation and exploration. Paul also notes this in his blog when he says ‘the best [policy-makers] have a good dose of creativity in problem solving which is used to tackle a challenging situation.’ Using problem solving techniques and applying creativity are central to design practice. These designerly skills (which some call design thinking) have helped policy-makers explore different ideas before deciding which options to follow. 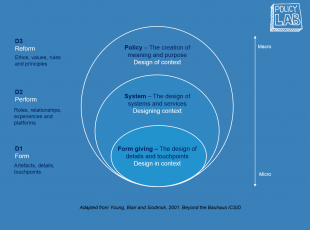 At the Service Design Fringe I mentioned a keynote I gave back in 2001 in Seoul which proposed three levels of design; D1: the design of detail, D2: design of services and systems and D3: the design of policy. Over the years I have found this simple framework helpful. It also shows how designers ‘zoom in’ to the detail and ‘zoom out’ to the context when exploring new ideas, shaping both the brief and the solution together. 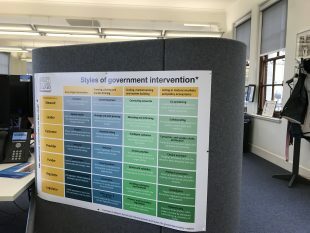 Over the last three and a half years I have been working mostly at the ‘D3 level’ in the Policy Lab. As a result when I talk about design, I use the term broadly, I don’t see any contradiction between service design, policy design and traditional design. For me design offers an approach, what I have defined as ‘purposeful creativity’, which has a lot more in common with policy-making than many might think.